Hot Glass Glassblowing, Computers, Servers, and More! USB 1.1 peripherals can operate at a maximum speed of either 12Mb/s or an even slower 1.5Mb/s (which might be used by a mouse or keyboard). In comparison, USB 2.0 has a raw data rate at 480Mbps, so it is rated 40 times faster than its predecessor interface, USB 1.1. Is it possible to add the much faster USB 2.0 to a Dell PowerEdge 2650? Defintely yes! Here is what has worked for me. 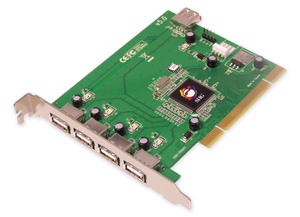 Here is the official Siig web page for their Model JU-P50212-S5 USB 2.0 PCI card. eBay — I have purchased (both new and used) for a low of $0.99 each to $10.50 each (the average was probably closer to $6). I’ve purchased a total of 15 Siig JU-P50212-S5 for my Dell PowerEdge 2650’s– most from eBay — and every one of them has worked the first time! It makes a huge difference, running Clonezilla, to have USB 2.0 and its faster transfer rate, which allows me to do a bare metal restore (BMR) backup in one hour. This entry was posted in Dell PowerEdge 2650. Bookmark the permalink. Don’t Judge A Book (or Glassblowing Mold) by its cover!